Two soldiers hoping to dessert. War movies are a dime a dozen. More often than not, they are simply action movies, only with all the characters dressed in uniforms. What comes to mind is movies like Inglorious Basterds, which was Quentin Tarantino essentially parodying the World War II genre as a whole, or Pearl Harbor, Michael Bay’s attempt to recreate Titanic by having the Japanese Navy exploding American ships in awe-inspiring CG as a backdrop to a lame romance. Let’s not even go into newer movies like Act of Valor, which basically can be retitled as Call of Duty: The Movie. 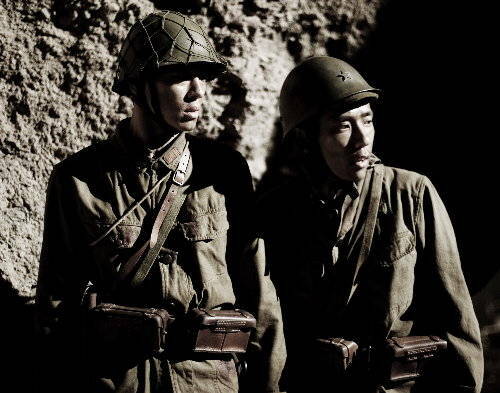 I finally got around to seeing Letters of Iwo Jima (硫黄島からの手紙, Ioujima kara no tegami) after having seen its companion piece Flags of Our Fathers and the HBO miniseries The Pacific. Both Flags and Letters were Clint Eastwood-helmed movies concerning the Battle of Iwo Jima. While Flags followed the US Marines (and Navy Corpsman) who raised the flag on Mount Suribachi, Letters surrounded the Japanese defenders of Iwo Jima. Letters of Iwo Jima primarily concerns itself with General Kuribayashi (Watanabe Ken), Private Saigo (Ninomiya Kazunari), and Senior Private Simizu (Kase Ryo). As you can imagine from the title, an important part of the movie is our leads writing letters to loved ones back home. It becomes clear that our three leads are not what one would expect from Japanese soldiers. Saigo was a baker who was forced to leave his business and his pregnant wife behind when he was conscripted for the service while Kuribayashi visited the United States before the war, and thus doesn’t buy into the Japanese state-sponsored propaganda of Americans being barbaric cowards. Needless to say, our leads are caught up in the insanity of defending Iwo Jima from the Americans. Everyone knows it will be a suicide mission. Most still believe it’s their divine duty to give their lives for the sake of Japan. In many ways, Letters of Iwo Jima depicted the insanity of war much in the same way the classic novel (and subsequent 1930 movie) All Quiet on the Western Front did. The scene that comes to mind most easily is when Saigo’s unit loses Mount Suribachi to American Marines. His captain then orders his men to commit suicide, despite Kuribayashi’s orders to retreat. One by one, you see soldiers exploding themselves with hand grenades as Saigo looks on. You also see two different instances of Americans getting captured by the Japanese. One gets tortured to death, the other one receives medical attention. You see almost exactly the same thing happen in the two instances when you see Japanese soldiers surrendering to American forces. In general, what I look for in a good war movie is treating its subject matter fairly, that is to say not painting one side as good and the other as bad. In many American movies about the war, the Japanese are quick to be portrayed as nothing but these little monsters with fanatical desires to kill Americans. I think Clint Eastwood subverted that by making his movie from the Japanese perspective and thus allowing them to actually be characters. In fact, it’s the US Marines that get the treatment most “enemy” forces do in war movies by generally being generic, faceless people despite being also depicted in Flags of Our Fathers. In many ways, Clint Eastwood’s Letters from Iwo Jima was what Terrence Mallick’s The Thin Red Line should have been. The Thin Red Line was a movie that focused on individual American soldiers and their backgrounds during the Battle of Guadalcanal, and was a favorite for the 1998 Academy Awards, but then came a little war movie that was known as Saving Private Ryan and The Thin Red Line was all but forgotten about. Now that that little digression is out of the way, Letters from Iwo Jima seemed to develop its characters in a similar fashion to The Thin Red Line, but only did so better by having fewer characters to keep track of and generally pacing the movie more well. Letters from Iwo Jima generally was more understated than what I would have expected from war movies. While there was still enough graphic violence for the movie to warrant an R rating, I thought movies like Saving Private Ryan and even Flags of Our Fathers were a lot more concerned with depicting realistic war violence. On the other hand, Letters focused on the pyschological toll the war took on the Japanese soldiers, which is manifested in the distrust Saigo and other soldiers feel for Shimizu, a soldier who joined their unit after graduating from a military police school. Ultimately, Letters from Iwo Jima succeeded as being a poignant character study. I wasn’t really a fan of Flags of Our Fathers, but I will say war movies don’t really get better than Letters from Iwo Jima with its terrific pacing and tight construction.